Liriope muscari ‘Aztec’ (also sold as Ophiopogon spp.) has a tufted stoloniferous growth habit and can get up to 24″ tall. Aztec Grass has white spikes of bell shaped flowers in the summer. 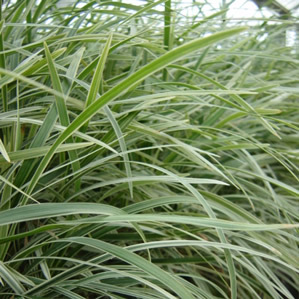 This grass is prized for its foliage which is variegated pale yellow to white. Aztec Grass is slow growing and has a coarse root system and is not as cold hardy as other Liriope spp. so keep protected until well established.